Using the "even count" flat peyote stitch, you will learn to make tubular beads out of Japanese Delica seed beads. You will then link these tubes together to form a gorgeous contemporary beaded bracelet. 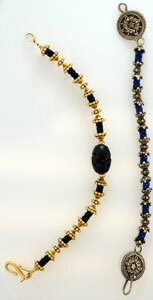 Once learned, this technique can be incorporated into necklaces and other beaded jewelry pieces. This project will be completed at home. This stitch is a very basic peyote stitch and this class is well suited for beginners.